What Camera Should I Buy? The Most Important features to get in your new camera. I am present in a lot of photography forums online, and an active contributor in a select few of them. One of the absolutely most common questions in almost every single one of them is "what camera should I buy?". It's a big investment sometimes - a new camera body, so it's no surprise you would want some second, third, or forty more opinions on it. For every time that question gets asked, there is an equal number of individuals who have a few, very repetitive things to say. I am going to say those things, and one major little tidbit that tends to get left out. Read on for more information about what is the absolute best camera to buy for your needs. Every single pro is going to tell you that your camera isn't the piece of the puzzle you're missing on your road to success. A new top of the line camera isn't some sort of magic ingredient to even better photos and greater success and attention in all the social media platforms. It definitely is not. They'll all say 'it's not the tool, it's the person using it'. Which is an old, almost clichéd adage that goes for just about every art form and trade, or any skill in general. That is not wrong, they are not leading you astray by saying that. If you cannot create a good composition then a new camera isn't going to help that. If you can't see beautiful light, a new camera isn't going to help that either. Imagine your camera sensor is the tastebuds on your tongue. The picture you take is like a fine wine. You may like it complex with many layers, or simple, or whatever, your taste is your taste. If you are trying to enjoy that wine through a straw made of sh*t then even your most favorite wine isn't going to taste very good. It will be muddied with the taste of the straw. So don't deliver beautiful light through a crappy lens to your camera sensor or it will be muddied with the imperfections of the lens. Where am I going with this? It may seem like I am trying to talk you out of buying a new camera body - I'm not. All I am saying is more often than not, fresh photographers or hobbyists think that the latest and greatest camera body is what is standing in their way. And all I am trying to say that there are many pieces to the puzzle, and a lot of them are far more important than the body you're shooting with. When you think it is time to buy a new camera, ask yourself what do you need it to do that you can't do already? Now we are getting down to the root of it all. It's really new body vs new lens. If you don't have real quality lenses that cover a full range of focal lengths, in my opinion, you should really work on upgrading that before you upgrade your body. Heck - I still shoot with a nearly 10 year old Canon Rebel XTi sometimes. Not my primary camera now, but I bet no one could tell the difference on Facebook, or instagram, or Flickr, or 500px what I've shot with which if there was no EXIF data to go with it. I curate images for a major microstock agency, so it is not uncommon for me to inspect a thousand different photographs in a work day. I see a lot of great work, and I see a lot of small, but critical errors on images that would otherwise be amazing. A lot of times I have to reject things for their focus. It just isn't sharp. I don't mean focus isn't placed in 'a good spot'. I mean that there is nothing truly sharp or in focus in the entire image. In art - that can be fine - it's art - it is what you want to create. But stock imagery is meant to illustrate a point, and it's part of the deal that in almost all photos there needs to be something in focus. There are some individuals that so consistently send images that do not have something in proper focus, that I wonder if they just don't know what a truly sharp focal point looks like. Don't let this happen to you. My suggestion would be to learn how to make what you want sharp, and then figure out how to play with making things blurry. Not the other way around. I'm starting to stray from my point a bit, but these are all related to the topic of why a lot of amateurs and hobbyists think they need to buy a new camera. The truth is, the best camera, is the one that you will want to use, and will keep on you. You probably already have that camera. If are getting into DSLR photography, and are not upgrading from anything, well then you will need to approach your purchase in a different manner. Now that I've talked your ear off about how the lens is always of greater importance than the camera body you put it on, and blah blah blah, I am going to confuse you with this little bit about which part of your camera is of monumental importance. 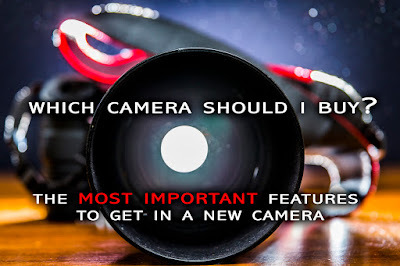 Hands down, one of the most absolutely important features to look for in your next camera purchase if you in any way want to become a professional at any point down the road. In the film days, each camera body had its own features, but more or less they were the same. But photographers really had to pick and choose the film they shot with and when they found something they liked, they stuck with it. Part of that still lives on today. A digital camera that handles high ISO better - which means introducing less noise - is going to be a better, more versatile camera for longer, than one that is crappy at it. That is what it all comes down to. When you have a camera that handles ISO noise better, you can get things sharp easier, you can get things exposed properly easier, and when you make those two things easier, you can focus more on making a great composition - which is what it all boils down to. Sure, there is noise reduction software, but it is always so much better to have something 'fixed' by the time it gets out of the camera instead of trying to fix it on the computer. Because we no longer need film in digital cameras, each camera comes with just one roll - one sensor. That's it. Don't buy the camera for the features it has, buy it for the film it uses - the sensor it has. Then it all starts to makes sense when it comes to your camera shopping. And the other features closely related to your ISO noise handling are your dynamic range and your colour rendition. The dynamic range, and colour rendition were the two characteristics of the film you shot on, and not the camera you shot with when we look back at the film days. Your sensor (film) is like both the paint and the canvas, the body is just the paintbrush. As a beginner, or hobbyist or amateur you may not notice much of a change from the best and worst sensors in that way, but a pro already knows to look out for these major factors. I just wanted to help you figure out the big secret. Figure out what your budget is. Are you just starting, or are you upgrading? If you're just starting, remember you are buying into a brand, a product line. It becomes expensive if you decide to switch to a different brand later on. Do you want this to go further, as in one day getting paid for it? - If yes, then start out with a relatively basic camera (a 'body only' purchase) and splurge on a top quality lens to go with it. Avoid the kit lens at all costs unless photography is for your own personal entertainment and records and nothing more. If you want to some day make a living of it - stick to the two biggest names. You will have the widest range of products available to you, with the widest range of prices, and of course with the widest range of quality levels to suit your needs. Most importantly ; pay close attention to the noise handling in the camera you want to buy - almost every camera has a review and comparison out there that focuses on this all important bit. That's it. There's nothing about megapixels in my list, there isn't anything about focus points, or wifi capability, or cell phone connectivity, or anything like that. Remember : You never need the latest and greatest camera. When you think you do need the latest and greatest, send an email to the marketing department and tell them what a great job they've been doing instead. I hope this article helps you in your next shopping trip for a camera, and maybe even gives you some extra time to save some money until you really need a new one.